Arcadia Congregational Church is a member of the United Church of Christ, which is devoted to the concept that persons of widely differing theological understandings can join together to form a Christian community of faith. As individual members, we are free to believe and act in accordance with our awareness of God's will for our lives. But we are also called to live in a loving and accepting relationship with one another. We are a church with an open table, inviting all who want to follow Jesus' message of love, forgiveness, and service to join with us in worship. Our church is here to nurture your spiritual quest. 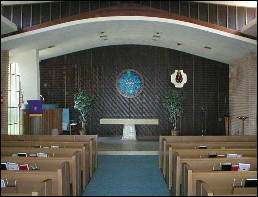 *For more information about the United Church of Christ visit www.ucc.org. Our Lenten Series will continue for two additional weeks during the month of April on Wednesday evenings at 6 p.m. in the Fireside Room. On April 3rd, hospice chaplain, Angel De Rosas, will be our guest. He has often attended our worship services when he is on vacation. Methodist Hospital chaplain, Stephen Wilson, will be sharing his stories with us on April 10th. Sign-ups are in the Narthex. Please join with us on April 14th in the festivities as we wave our palm frons and sing "Hosanna." This will be a very spirited Sunday celebration. Our Maundy Thursday service will start at 6 p.m. on April 18th with a meal and traditional abbreviated Seder dinner retelling the story of the exodus of the Hebrew people from Egypt. We will then proceed into our sanctuary for a worship service that remembers Jesus' last night with his disciples. This will be a meditative experience. We have been invited again this year to join with the members of the Eagle Rock Lutheran Church to join with them for Good Friday, April 19th. The service will begin at 7 p.m. and will be followed by food and fellowship. The church is located at: 5032 N. Maywood Ave., Los Angeles. This Easter Sunday on April 21st will be an inspiring and memorable experience. The music will fill your hearts with joy. The words spoken on that day will celebrate the risen Christ. And the flowering of the cross will be an experience you won't want to miss. We ask that you bring some food (no desserts please. There will be desserts for sale) and flowers to share on that day. We will also be having an Easter Egg hunt. The Arcadia Interfaith Action Group will be holding its annual National Day of Prayer service on Thursday, May 2, at 7 p.m., at Temple Beth David in Temple City. We will be having speakers who will share with us how their faith tradition teaches them to speak truth to power. Address will be available for those who wish to attend.